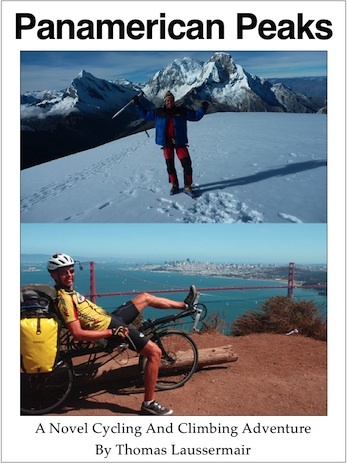 Distinction: Highest point of Peru and highest mountain in the tropics worldwide. Summary: I climbed Huascaran as part of a small, 7-day expedition from Huaraz. I joined another group consisting of 1 guide and 2 Spanish clients. I had my own guide, but we shared all other infrastructure, porters, cooks, transport etc. We first did a 3-day acclimatization climb of Nevado Pisco (5,752m), which was very useful to get to know each other, test the rental equipment and a very rewarding mountain in its own. The approach was non-trivial, with friction hiking over granite slabs (formerly covered by glacial ice) up to the glacier and Camp 1. The section between Camp 1 and 2 has two dangerous sections: The Canaleta, a 300m vertical stretch with no alternative with seracs hanging high above. And then the traverse to the Col over avalanche debris. Both these sections are avalanche-prone so we crossed them in the early morning before the sun hits the slopes. We spent an extra day at Camp 2 since the guides were exploring and breaking trail above camp all the way to the summit to make it easier for us clients the following day. Summit day was clear at first, with steeper terrain than I thought, and the final push up on the summit ridge very cold due to the wind, high altitude and less-than-optimal rental equipment. Unfortunately some clouds rolled in just before we reached the summit, so no views from the summit. The descent was concluded safely and we enjoyed getting back to green plants, life and warmth. We meet at 9am at Enrique Expedition’s office in Huaraz. I buy some more chocolate bars and some socks (for the rented boots). I also get some more cash from the ATM as I can only get $200 at a time and need to pay a total of $1,500. We take a cab to a bus stop; from there we take a mini-bus to Yungay at the base of the Huascaran mountain. Stunning views of Huascaran during this 40km drive – on a very bad road with lots of potholes. Then we change into a taxi again for the drive up a dirt road to the Parque Nacional Huascaran and the Llagunas Llanganuco in a narrow gorge between Huascaran and Huandoy. Amazing landscape here, with Huascaran Norte some steep 3,000m above the llagunas. The trailhead is at 3,800m; here we load our bags onto mules. Nevado Pisco towers some 2,000m overhead. We wait for the two Spanish clients. We also have lunch – some bread and bananas. Then we leave around 1:30pm and hike up to base camp. It’s great to be up here on a sunny day; the surrounding peaks are just phenomenal. It almost feels like in the Alps, except everything is about 2,000m higher. We walk up about 2hrs and roughly 800m until we reach a grassy meadow below the glacier moraine. A bit above is the Refugio Peru (4,680m), a very similar to a hut in Switzerland or Italy; no coincidence, as it is built by the Italian Club Alpino. We (the 3 clients) go there for a hot chocolate and to wait for our mules to arrive. Very nice atmosphere in the hut, also a Swiss tour group up there. Then we descend back 50m or so to our tents at base camp. The guide Darwin and the cook have already set up the tents, very kind of them. We have some tea and a bit later dinner (noodle soup and trout with potatoes). We crawl into our sleeping bags by 7pm as it gets cold and as we will get up very, very early tomorrow. On the descent it gets very hot on the glacier and my first goal is to get off he glacier. I need to walk carefully as there are still steep sections. My (rented) Koflach plastic boots are not very comfortable, but I hike in them today for 11hrs round trip without blisters. I sit on the rocks right off the glacier, take off my boots, eat and drink, and wait for the other 3. Afterwards we continue down and I am very tired. The second crossing of the moraine is very hard. Finally after 11hrs we arrive back at base camp around 1:15pm. I sleep for an hr or so and we all drink some coke and tea. A bit refreshed I go for a walk to the nearby Refugio Peru and another lookout point. Around 4pm I’m back at the cook tent and typing these notes while dinner is cooking. We sit there until 5:30pm when dinner is served (chicken, rice, potatoes). After sundown it gets quite cold, so it is not very comfortable. I brush my teeth and at 7pm I crawl into the tent and sleeping bag for a 12 hr sleep! The sun hits the tent around 7am. Unfortunately the design of this tent is such that the moisture is running down the inside and dripping into the tent. We get up to dry up sleeping bag and outer tent shell in the sun. The view of Nevado Huandoy (6395m) and the many other mountains around is amazing. We have breakfast around 7:30am (rice pudding, bread, eggs, tea). Then the guide and porter pack away the kitchen tent while we are readying our own stuff and backpacks. Soon the mules will be here to carry our gear down, while we will have an easy walk down to the road. At 11:30am we start our trip back by minibus to Huaraz. 1400m descent on bad gravel road, then 40km to Huaraz on bad, pot-hole riddled main road. 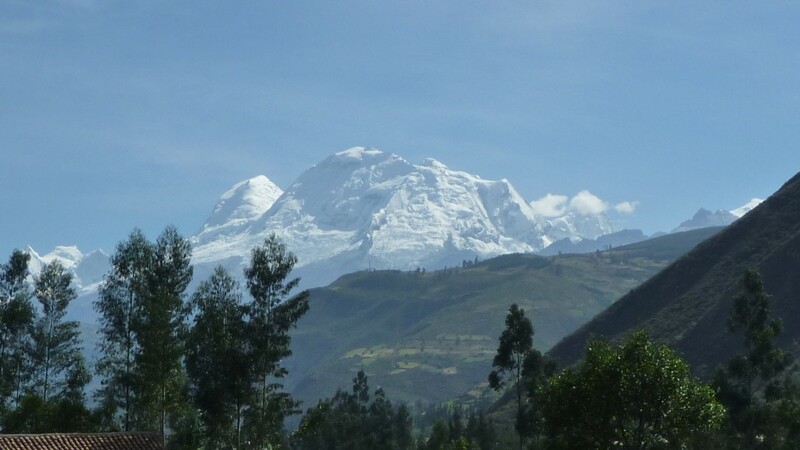 We arrive back in Huaraz at 2pm – what a different world from up there on the mountains! We meet at Enrique’s office in Huaraz at 8am for logistics, to load all the gear into the mini-bus and to have breakfast at a nearby restaurant. We leave Huaraz around 9am. The same bad road towards Yungay, but we turn off that road before Yungay heading up towards Musho. Another bad gravel road; except this time we reach the end of the road much lower around 3050m. The mini-bus is unloaded and most of the bags are loaded unto mules. We buy some water and fruit at a little tienda and around 11am we start our hike. It’s a beautiful hike through Eucalyptus forest at first, then gaining altitude and a great view of the valley below. At a rest spot with a large boulder we encounter a group of 6 Austrians with 2 guides and several porters. Good to know that we’re not the only teams on the mountain. It takes us 3.5hrs to get all the way up to base camp at 4200m. At 3pm we set up our tents after unloading all the bags off the mules. It’s a beautiful spot, like a balcony with a view down 1500m to the valley. There is also a stream of glacial melt water coming down right past our tents. We get some tea and crackers while sitting outside in the sun, very lovely with the great view. Then 1hr of relax time in our tents with the sun shining in, then some sunset photos and finally getting ready for dinner in the big mess tent. Later the night view all the way down to Musho, Yungay and even Huaraz in the distance is quite something. Into the tent by 8:15pm. We get up at 8am and have breakfast. However we wait until the sun comes up above Huascaran around 9am to dry up our tents before we pack them. Then we start hiking around 9:45am. The path is quite steep and the terrain is interesting, big rounded rock which used to be at the bottom of the glacier. This makes for some tricky sections with the friction of the boots just barely enough to ascend. After about 2hrs we reach the Refugio Don Bosco Huascaran at 4680m, where we stay for a long, 1hr rest. It’s a beautiful building built largely with the local rocks and it blends nicely into its environment. Another hr hiking uphill and we reach the beginning of the glacier at 4,950m. Since the snow is fairly soft and the terrain not too steep we walk without crampons. Another hr or so and we reach a flat shoulder on the glacier where we pitch our tents at 5,340m. I send an OK message as usual. We drink and have some soup and pasta with meat for dinner. Unfortunately we have no more cook tent, so cooking and eating happens outside now, which is not nearly as comfortable. The large Austrian group comes up 1hr behind us and they need to dig out little platforms for their tents. The view of the icefall above is quite stunning; twice there are avalanches, which create quite a loud sound. All a bit intimidating! At 6:30pm I crawl into the tent and sleeping bag. Now we are three in one tent, which requires some coordination amongst the three of us. Tomorrow will be a big day and we will get up at 3am, so we try to get some sleep early. We get up at 3am. The sky is totally clear and one can see the stars of the Milky Way and all the little lights down in the valley, as well as the dark, ominous mountain looming above. While it is not fun to get out of the warm sleeping bag in the middle of the night into the cold, such impressions at night add to the incredible experience of mountaineering. We pack all our stuff and leave at 4:15am. The path leads directly up the glacier towards the crux of our climb, the Canaleta. This is a steep gully of ice, leading roughly from 5,400m to 5,700m. There are huge seracs high on the ridge above and there is also avalanche debris of some 2week old ice-fall directly down the Canaleta. We try to cover this section as fast as we can, but there is still an uneasy feeling accompanying me on this section. At one point we climb up to the side to be out of the avalanche path, but there is 70deg steep, hard ice to negotiate. My guide Christian runs out the entire length of our rope and then secures this pitch from a stand above. Thus secured I enjoy this challenge: My front picks of my crampons go in only 1cm and I need both ice-tools for purchase on the hard ice; certainly the most difficult ice-climbing I have ever done! Behind me are two porters on the same rope who struggle mightily in this steep section due to their oversized backpacks. Eventually we reach the top of the Canaleta around 7:30am; now I realize how this steep part has taken a lot out of me and I need more frequent rest stops. We need to traverse to get to the big Col between the two Huascaran summits. There is a descent of maybe 80m or so down another avalanche debris field. Not a good spot to be in – so again we hike as fast as we can. Which isn’t very fast anymore, as we are now around 5,800m, almost Kilimanjaro summit altitude. Below a huge crevasse – some 30m deep and more than 250m long – we come upon a small flat spot which has been used for Camp 2 before. The guides decide to use this as Camp 2 again. It’s only 9am and we have a beautiful day with another 11hrs of daylight ahead of us. I personally think that it is a mistake to camp so low (5,900m), as we now have almost 1,000m vertical to reach the summit tomorrow – and today we did only 500m! Plus there is no trail ahead, as nobody has been any higher on Huascaran this beginning season yet. I suggest to go higher for Camp 2 buy my thoughts are dismissed and the tents are quickly set up. They say the terrain up higher isn’t suitable and there is usually more wind up there. At this point I feel like this poor decision will cost me the summit and am a bit disappointed. You are, after all, at the mercy of your guides, whether they make good or bad decisions. Well, they should know best. So with nothing much to do but sit around for the next 10hrs I eventually retreat into the tent for a nap, some snacks and to type these notes. The two guides eventually go ahead and break trail – hard work in at places deep snow – and recon / secure the route due to the many crevasses. They return hours later – 2 guides from the Austrian team have shared in the trail-breaking work. Beautiful evening light just prior to sunset, so I take several photos. The guides are tired, understandably. Their plan is to take another day tomorrow to break trail all the way to the summit. Then the day after tomorrow they would go with the clients to the summit. 3 nights at 5,900m! Day 2 in the refrigerator! Not very comfortable sleep, just tossing from side to side really. At 2:35am there is an Earthquake which jolts the ice under our tents, followed by the roar of some ice fall – but this location near the Col is fairly safe. After Denali and Aconcagua this is now the third high mountain where I experience an Earthquake! After 14 hrs in the sleeping bag I get up to pee. The sun hits the tent at 8am and it immediately warms up from -5C to about 15C. Unfortunately there are pretty strong winds out there today, so one is more or less confined to the tents. The guides left at 5am to break trail towards the summit; very hard work and quite cold for them. Small scraps for breakfast as there is not a lot of cooking in this strong wind. I sit in the tent again to type these notes. As it is fairly comfortable and warm in the tent I have time to contemplate the project as it is nearing its end. Then I listen to Steven Pinker’s “The Stuff of Thought” for several hours. It’s rare during my project that I have so much time to contemplate – now about 30hrs in the tent! The ascent is much steeper than I anticipated. It meanders between Seracs and large crevasses. The terrain is quite steep and one needs to focus 100%. We clients have one ice-axe and one trekking pole, so we always need to switch hands at switchbacls to ensure we have the ice-axe on the mountain side. The group of 3 ahead is quite a bit slower than Christian and I; due to the resulting frequent stops and waits I start to get quite cold. I put on every bit of clothing I have up here and am happy I donned 3 pairs of socks. At one short rest Christian and I leave first, essentially bypassing the other group. It is getting really cold now, and I struggle to stay warm. Hopefully at 6am we get some sun and then warmer temperatures. At 5:30am we get the first signs of dawn. The panorama is quite fascinating, but unfortunately there is little time to stop and enjoy, as with increasing altitude the icecold wind is intensifying. And unfortunately the ascent is always in the shadow of the mountain, plus there are some clouds forming now which are illuminated bright red by the rising sun. Again the triangular shadow of the highest mountain to the West, just like on Aconcagua for example. From neighbouring sunlit Huascaran Norte (6650m) I can gauge our altitude quite well, we are really getting up high now around 7am. I take two photos of the Cordillera Blanca, with all it’s peaks now lower than we are. What a great place to be! But the cold wind is killing me. Up here you can’t move faster to generate more body heat, you simply don’t have enough oxygen to move fast. I have struggled the last hr already maintaining a slow rythm, and only double-breathing at every step allows me to maintain a steady, albeit very slow pace. Since I don’t have a face mask, my face is hurting from the left-front wind. Once I stop and take my face in my bare hands to make sure I still have feeling in the cheeks and nose – don’t want to get frostbite up here. Long minutes of internal debate as to how much longer I can tolerate these conditions without bodily damage. According to my altimeter (actually showing too little altitude) it’s another 100m vertical or so, brutal, but now that I’ve come so far and so close? And then my guide stops at a platform with several flagpoles in the snow and it’s all downhill in all directions – we are at the summit of Huascaran Sur, the highest point of Peru and the highest mountain in the tropics! A bear hug for my guide Christian and then I throw up my arms in victorious pose, but my feelings are muffled due to the extreme cold. The wind is probably around 40-50km/h and the temp -15C, so the wind chill is biting and my limited gear makes me feel it bitterly. Unfortunately no visibility as we are in the clouds. We just take a summit shot of each other and I push the OK button on my SPOT. But after a few minutes we can’t wait for the signal to be transmitted, it’s simply too cold. The second highest summit of my project, by far the coldest and as a result the shortest stay, less than 10min. Going down provides immediate relief from the worst of the cold as we are walking away from the wind and it’s so much easier to walk down. After 80m vertical we meet the other group, still toughing it out towards the summit. We wish them well and then continue down. There are many steep sections and traverses right above monstrous crevasses, so the utmost attention is called for. A slip on the ice or trip on your crampons could send you flying down a steep slope right into a huge crevasse – that would ruin your whole day! And as so often, I have used so much energy on the way up, that I am now getting very tired; at least no problems with altitude, no headache, no other AMS symptoms. I have to stop frequently to catch my breath and concentrate. We are not in a rush, with plenty of daylight – although there are signs of more clouds forming everywhere and the wind intensifying. This is far steeper than I thought up here, so pay attention! 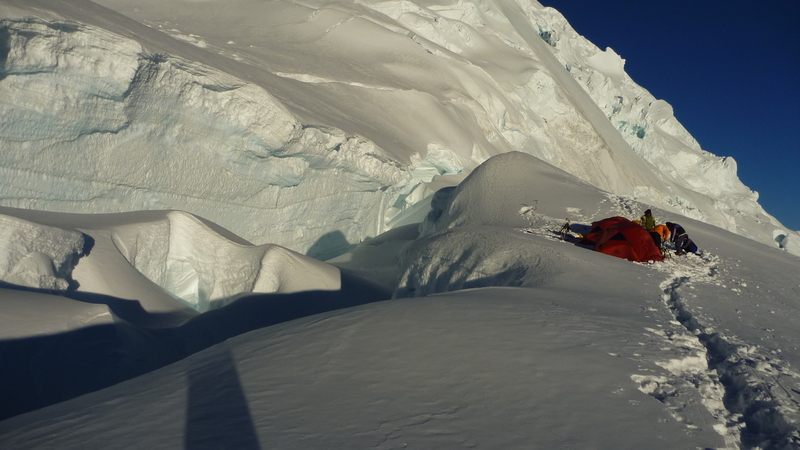 Eventually we get down to the Col and after jumping 2-3 last crevasses we make it back to Camp 2 by 10:30am – 9hr round trip, 6hrs up, 3hrs down. I am very exhausted, but happy to have made it down safely. Both Christian and I disappear in tent after the congratulatory welcome and cup of hot tea from the porters and cook. Outside the wind is howling, but we are warm inside. After more than 2hrs we start to worry a bit about the other group; they shouldn’t be this far behind! After nearly 3 hrs of them not showing up we plan to go back up to search for them and start putting on our gear. Just as I walk over to the 2 tents of newly arrived Austrian climbers to perhaps summon their support we see to our great relief Darwin and the two Spaniards come down only 10mins away from camp. They apparently had a) a very slow moving client and b) trouble seeing the path as the wind was quickly covering it with drift snow. Still hard to imagine that they would take almost 3hrs longer than we did; and yet another example of why speed is often a good thing in the mountains where deteriorating weather often plays a big role. After this much adventure into the tent to type these notes and get some rest. Some hot soup and a surprisingly tasty goulash with potatoes for dinner and we pretty much remain in the tent due to the cold wind outside. The adventure isn’t quite over yet: At 11:30pm the wind gusts are so strong that the tent is pushed flat on me. I’m thinking if the wind rips the tent we are at 5,900m on a glacier in the middle of the night on a cold storm! Good thing the two layers of Nylon and the aluminum poles are designed to withstand such strong winds! We get up at 5:15am; with three people in a relatively small tent trying to put away the sleeping bags and putting on all their clothing, harness, boots etc. that’s quite a commotion. We want to cross the dangerous sections of the long traverse and then the Canaleta early in the morning to reduce the risk of avalanches. I’m not warmed up yet when we hit the part where we need to climb up some 80m or so over avalanche debris. The guide pushes us to minimize the time spent in this area, but that doesn’t make it any easier to hurry up there cold and first thing in the morning. Beyond the traverse we then descend the Canaleta. In the one tricky section our guide Christian lowers us down the steep ice and then across the crevasse using a secured top rope. After that it’s easier to hike and soon we ate in the flat and safe area of Camp 1 and below. We shed some layers of clothing and can now walk the lower section of the glacier without the rope. Soon we reach the end of the glacier and after another 300m vertical descent we reach the Refugio Don Bosco Huascaran, where we again pause for 1-2 hrs to dry up all our stuff. I also use the bath room and brush my teeth (after some coffee and cookies for breakfast), something I hadn’t done in the stormy cold winds last night. Around noon we continue our descent over the big granite blocks rounded by the glacier in millenia past. This section of the trail is also quite tricky, as you often walk right at the friction limit of the stiff plastic boots. Only after this section back down at base camp can you relax – the technical difficulties and risks of Huascaran are now over! We have a late lunch and relax in the occasional sun between the cumulus clouds. We dry up and sort all our gear for tomorrow’s transport by mules. I lay in the tent listening to music and enjoying the relative warmth here in the afternoon sun. We have the last dinner, soup followed by rice with tuna, which is surprisingly good – perhaps just a sign of the appetite coming back with relative warmth and more oxygen. During dinner I thank all staff for the successful expedition – the porters, the cooks and of course the guides; without their help and great work this expedition could not have happened, much less been a success. I get up at 8am for a delicious double dose of breakfast (ham & eggs with tea). By 8:30am the sun hits our camp and we can dry up our stuff. At 9am my guide Christian and I are leaving and starting the descent. As I’ve experienced before, the return to lower altitudes is like a return back to life: you enjoy seeing the green trees, you smell the Eucalyptus, you notice the flowers, you hear the birds singing, you enjoy walking on grass – in short, life is good again. Around 11:30am we reach Musho and wait for our mules to arrive. Around noon both the mules and our mini-bus arrive. We load everything into the vehicle and soon we depart for the 1.5hr drive back to Huaraz. We are back to civilization and soon arrive back in Huaraz at Enrique’s office. We unload our stuff and plan to meet tonight at 8pm for a celebratory dinner at the nearby Pizzeria Monte Rosa – we have plenty to celebrate after this successful Huascaran expedition!